So if you're feeling particularly loaded and are looking for long-lasting, comfortable-to-wear and good-looking over-ear headphones then few can reach the same level of mastery as the BeoPlay H9. These will be our go-to cans for a long time coming. 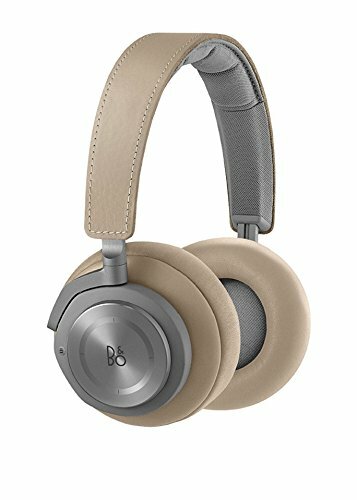 B&O BeoPlay headphones are all about comfortable wear, luxury materials, considered style and, well, everything that its Danish parent company, Bang & Olufsen, represents. That said, we've actually found the range of BeoPlay H-series headphones to have their ups and downs - from the Pocket-lint Award-winning H8 to the not-quite there H7. Can the H9, with oversized earcups and subtle noise-cancellation, cement its place as the over-ear headphones to buy, despite the high price? What's most striking about the H9 upon first pulling it from the box is the scale of the earcups. There's no mucking around here: this a proper set of over-ear set cans, with no pinch to the outer ears when wearing, ensuring there's plenty of room to breathe around those lugholes. As a result, comfort is high on the scale. With luxe materials - from anodised aluminium, to real leather - there's an immediate sense of quality, not only visually, but in feel too. The padding and leather sit plush around the ears; the earcups are soft, don't cause profuse sweating and are perfectly good for long periods of wear. The only aesthetic choice that isn't quite there is the plastic used for the main section of the earcups - which is where the connections and battery live. It's practical for weight purposes, sure, but the matte plastic finish doesn't hit the same visual satisfaction as the shiny surround, which is where the gesture controls are housed. As the H9 is Bluetooth compatible, it can be used wire-free, which is great for avoiding getting in a tangle. Sound is too quiet from a smartphone (darn EU regulations!) irrelevant of volume booster apps we've used, but from other sources, such as our MacBook Air, things have sounded plenty loud. Without a wire - if that's how you choose to listen, as one is included in the box - controls are handled by tapping and swiping on the outer earcups. One tap pauses or plays, while "wheel" action controls the volume - but we've not found a motion that makes the latter work, frankly. There's no track skip either, which seems an oddity. The other control is a swipe up to activate active noise-cancellation (a swipe down deactivates it), which is why the H9 has that built-in battery. It's rechargeable via the Micro-USB socket to the side of the 3.5mm headphone jack - which is all well and good, but in the age of USB Type-C it feels outdated. Next time? Not only is the H9 good looking, it's great sounding. Like, really great sounding. Which, for a £400+ pair of headphones, should be a minimal requirement, of course. But there are others that are, say, £100 less, yet sound nowhere nearly as adept as these cans. The size of the earcups is part of the reason for this: each ear almost "floats" inside, which gives a really wide soundstage that can be immersed by audio, rather than feeling like your canals are being battered by over-compressed output. Some more open earcup headphones can sound a little thin, but the H9 sound epic - with a really locked-in sound. This is down to the active noise-cancellation. Some have criticised it for being too subtle - but those with a critical ear will immediately find its benefits obvious. First, noise-cancellation engages bass to have even greater impact, striking with punch and purpose a little more than when the tech is deactivated. Bass and beats sound fat, without being oppressive - as you might find with the Beats Studio 3 Wireless. Second, noise-cancellation doesn't make you feel like you're in a vacuum. We've been using the H9 in the sky while commuting across Europe and the subtle removal of hiss and excess external noise is nigh-on perfect for our tastes. Audio-Technica takes a similarly deft approach to its noise-cancellation - something high-end listeners will appreciate in the (almost half the price) ATH-MSR7NC. The only issue we've found with the BeoPlay's Bluetooth and noise-cancelling is that once on, the H9 doesn't time-out. So forget to switch it off and despite the indicator light ceasing to show, you'll find a dead battery - which is a shame. Furthermore, we've not found the battery life to be the longest lasting, either. It's purported to be "all-day", at up to 16-hours of use, but we haven't found it to be anywhere near that. But then we do listen to music far, far too loud - which is probably part of the reason why. Still, you'll get hours of listening time from a charge, the batteries are interchangeable if you want to carry a spare, or just keep the cable handy for passive listening. It would be too easy to criticise the B&O BeoPlay H9 for the high price and the noise-cancellation being too subtle for some. But that would be shortsighted: because the H9 is a killer over-ear headphone. Indeed, these over-ear cans are better than almost anything we've listened to in 2017. Audio quality is immense, bass levels are punchy and pretty much perfect, while the wide soundstage pull on B&O's renowned character and class. If you're in town for a more neutral listen, with equally subtle noise-cancellation then this A-T pair of cans is a great buy. The build quality isn't up to B&O levels, but the price is far less by comparison. If bass is your thing and you want far more from your noise-cancelling technology, then the ultra long-lasting latest Beats are just the ticket. There's no noise-cancellig to be found here, but V-Moda's considerable audio is hard to not love. We're fans of the industrial-like design too, which gives a distinctive and high-quality appeal to these cushy cans.